I have talked in the past how you should ensure that your payment terms enable you get paid in advance before you start the work. It helps your cashflow and better allows your clients to budget. Many of the firms that I work with are starting to adopt this monthly in advance payment approach for annual work such as financial statements or tax returns. It sounds a little confusing but it’s actually quite simple. For example, if a client has a year end of 31 December then they would start paying from the previous 1 January in 12 installments, or in 12 installments up to the date it’s expected the accounts will be completed. If the firm is aiming to complete accounts within three months that 31 December year end would be done the following 31 March and the payments would start 12 months before March 31. How to explain it to clients? People tell me they love the idea but wonder about how to move clients onto the system. “Won’t there be a point in time when there’s a double charge – a catch-up?” they ask. They’re right. So you have to explain that properly. 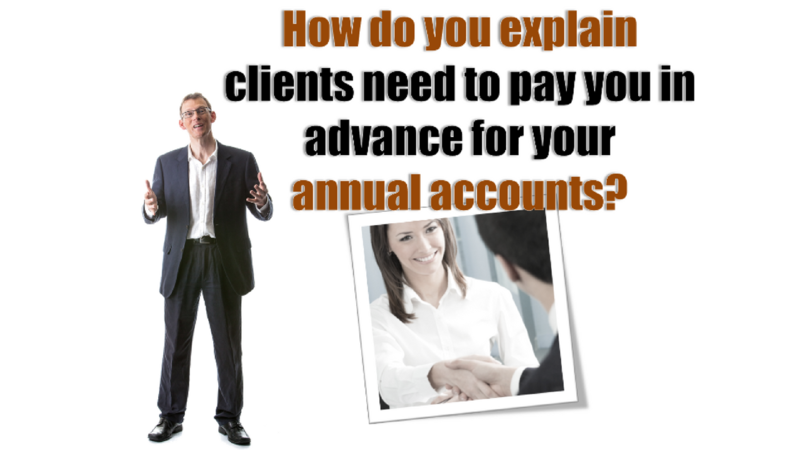 When you are sat down with them it’s most likely their previous accountant allowed them to pay in arrears. You then list the options – paying by credit card, finance, by cheque or spread the cost over the first few months by recurring payment. At this point our language has been clever. We’ve used it to focus on the benefit to the customer not ourselves. We’ve talked about helping them with cash flow, allowing them to spread payments and forecast and having a range of easy payment options for the catch-up. But effectively what they are doing is paying 12 installments in arrears for what needs doing now and in parallel 12 installments in advance for next year’s accounts. They are paying two lots in one. That’s how to move from the old way – being paid in arrears – to the new way of getting clients to pay in advance by up to 12 months. And that makes a huge difference to your cash flow. If you found this post helpful, then do please share it with your friends and colleagues.